Announcement Christmas Ornaments, Nativity Sets, Angels, Barrettes, Tie Clips and Cufflinks. Christmas Ornaments, Nativity Sets, Angels, Barrettes, Tie Clips and Cufflinks. Fast shipping, would purchase more barrettes in the future. Thank you! A scroll saw allows for fine detail and avoids the blackened edges caused by laser cutting. Handmade brass eyes ensure that our flat ornaments will hang facing outward from the tree. 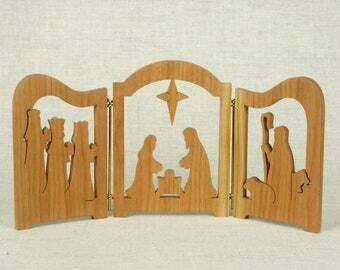 The nine piece Nativity Set (cherry pictured) is one of our most popular items. Our "3-D" ornaments are carefully assembled from three pieces of cherry. 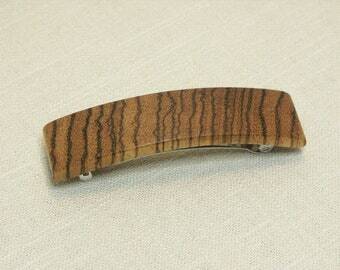 In 2014 we debuted a very successful line of barrettes. "Fine materials, clean designs and patient craftsmanship yield heirloom ornaments." Oregon HandCrafts was founded in 1983 by Ken Miller, an experienced woodworker. Inspiration for this business came when he was commissioned to make a set of reindeer centerpieces for a Christmas banquet. After adapting a design, it occurred to him that a smaller version would make an excellent tree ornament. Once satisfied with the new reindeer he developed several original designs and Oregon HandCrafts was born. In time the Christmas inventory would expand beyond tree ornaments to include many gifts and decorative items, including nativity sets, triptychs, angels and other designs. All of our ornaments and gifts are handmade using a scroll saw. Ken takes extra time cutting and sanding each piece to ensure that all edges are smooth and clean. The ornaments are then finished with a non-toxic oil and fitted with a handmade brass eye for proper hanging. We use only fine hardwoods. Our ornaments are made from cherry and Oregon Myrtlewood. The decorative items are made using a variety of domestic and exotic hardwoods, including cherry, oak, walnut, padouk and mahogany. We specialize in unique, scroll-sawn wood Christmas tree ornaments and gifts. All of our products are handmade by skilled craftsman Ken Miller in our small, family-owned woodshop located in northwestern Oregon. We believe subtle detail makes all the difference. Ken’s precise control of the scroll saw compliments the clean designs, producing beautiful ornaments you will be proud to own or give. We stand by our products and guarantee your satisfaction! If an order is incorrect or damaged, please contact us immediately so we can resolve the problem before you leave feedback. In the case of damage we will need proof before issuing a refund or replacement. A photo may be sufficient but we may also request the item be returned. If you wish to return a purchase for any other reason, please let us know within 7 days from the date your order arrived. After our confirmation send the items back (with a copy of your packing slip) to our return address. Upon receipt of the items (undamaged and in their original condition ONLY) we will issue you a refund for your purchase price, minus shipping & handling. We are not responsible for return shipping costs unless an exchange for an incorrectly fulfilled order is required. Major credit cards accepted via Etsy Checkout and PayPal. We ship by USPS first class or priority mail depending on weight and type of packaging required. Orders are typically fulfilled in 1-3 business days. All items are packaged in cardboard boxes or bubble mailers with added reinforcement. A tracking number will be provided when we ship. We cannot guarantee specific delivery dates. We may refund excess shipping charges for multiple items and international orders if the amount charged exceeds postage, insurance (if applicable) and our material/handling costs. Multiple orders to the same address placed on the same or next day may be combined and excess shipping refunded or may ship separately as needed at our discretion. If you have questions please contact us before placing an order. International orders are shipped by priority mail only. We do not accept custom orders.